I’m a bit of magpie when it comes to recipes and gather my inspiration from all over the place. That’s why social media was made for people like me with tasty ideas being shared every second of every minute of every day on the likes of Instagram, Twitter and Pinterest. One thing I enjoy most about social media is the way it’s allowed me to reconnect with family members strewn across the world and discover a shared obsession with food. Take my cousin Sisi for example in Australia. The last time I met her in person was at our family house in Malaysia and I was just eight-years-old. But since we connected on Facebook, I’ve got to know her and her lovely family and be wowed by photos of her culinary creations. Likewise with my Aunty Lorene. She lives in the States and I think the last time I saw her was in Singapore when I was in my early 20s. And I so enjoy reading her posts on Facebook where she recreates her favourite foods from her childhood in Malaysia. 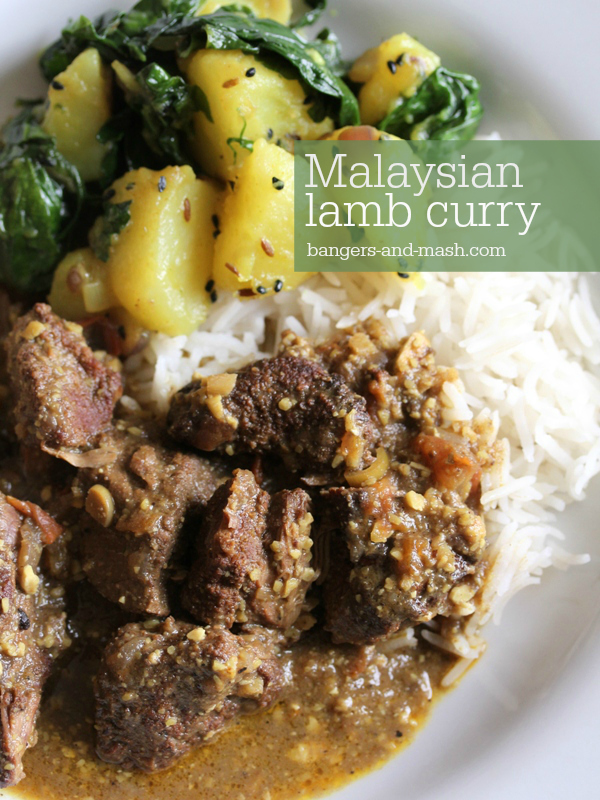 So when I was invited to come up with a lamb curry recipe using fantastic Welsh lamb to celebrate National Curry Week (12-18 October 2015), I turned to Lorene and Sisi for some Malaysian inspiration. And they didn’t disappoint. I made this Malaysian-inspired lamb curry for Sunday lunch today. I’m never entirely sure how my children will respond to intensely spiced dishes but I needn’t have worried with this one, although I did tone the chilli a fair bit. It went down an absolute treat and the bowls were wiped clean. It’s an amalgamation of the two recipes sent to me by Sisi and Lorene – I am indebted to both of them, as this is set to become a regular meal in our house I reckon. 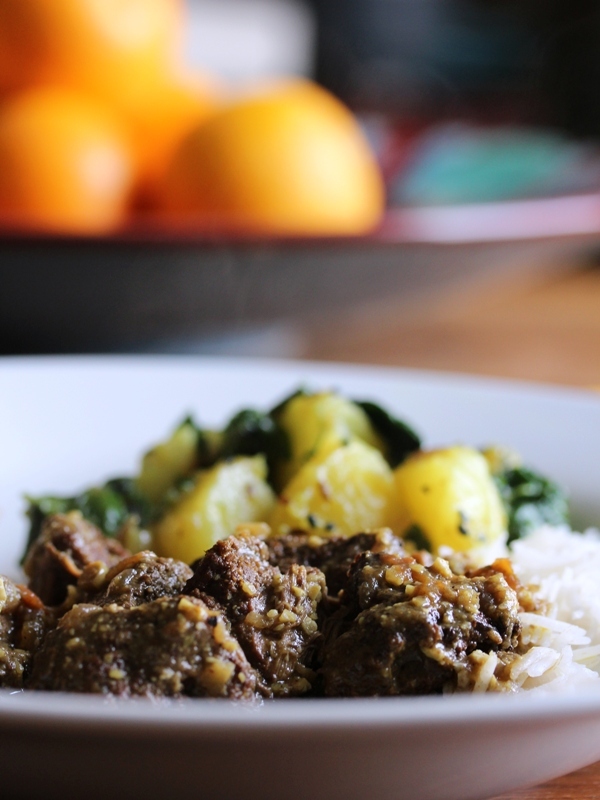 I slow-cooked the lamb, until it was beautifully tender and falling apart, cooked in coconut milk thickened with chopped macadamia nuts and flavoured with an array of spices, including coriander, cumin, fennel, cloves, star anise, lemon grass, ginger and galangal. I used wonderful organic Welsh lamb (diced leg), from the Rhug Estate in Denbighshire. Preheat oven to 150°C / gas mark 2. Add the coriander, cumin and fennel to the diced lamb in a large bowl. Mix well and allow to stand for at least 10 minutes. In a large casserole dish, heat the oil and brown the meat in batches. Remove and set aside. In the same oil, fry the ground cloves, turmeric and chilli for a minute before adding the red onion. Fry gently for around 5 minutes until soft and translucent. Add the chopped garlic, ginger, galangal and lemongrass. Fry for another minute before stirring in the lamb, bay leaves, star anise and cinnamon stick. Next stir in the chopped tomatoes, coconut milk and Macadamia nuts. Add salt to taste. Bring to a simmer, cover and place in the oven. Cook for 3 to 4 hours until the lamb is tender. 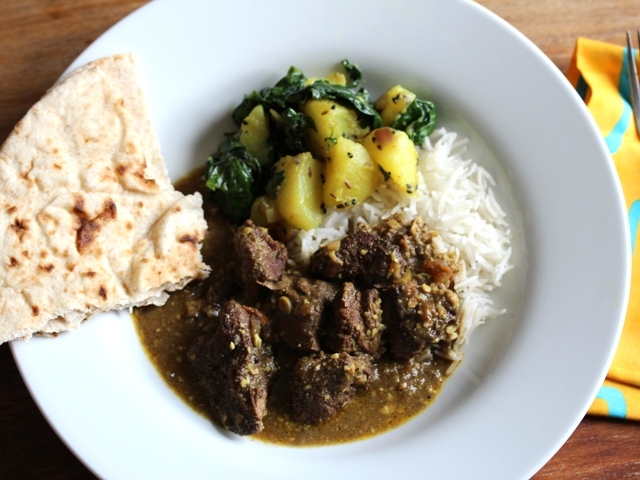 I served my lamb curry with steamed basmati rice, chapatis and spiced spinach and potatoes. 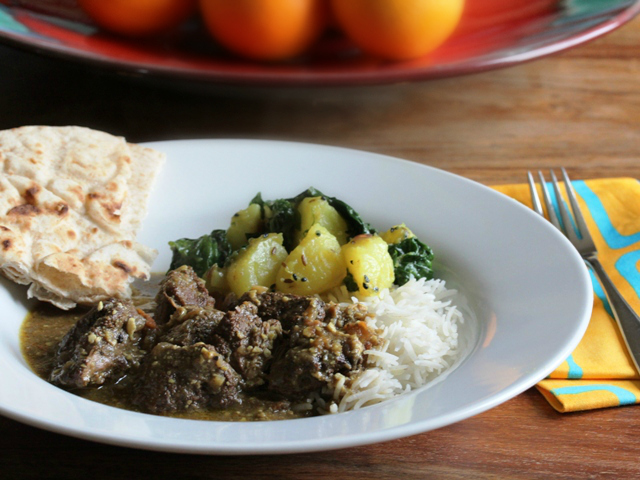 Disclosure: Welsh Lamb provided me with complimentary ingredients in order to develop this recipe for National Curry Week with a little help from my family. As ever all opinions are my own. I’m linking this recipe up with October’s Inheritance Recipes, hosted by Pebble Soup and Coffee & Vanilla. This month’s theme is Comfort Food. I love the flavours you used in this curry. Sounds amazing. Beautiful photography. Curries are the perfect comfort food. Andy is the expert curry cook in our household but I might just surprise him with this recipe. 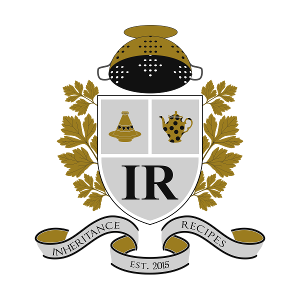 Thank you very much for linking it to our #inheritancerecipes challenge. oh that looks so good. I love a good curry and, for me, lamb makes the best so much flavour.